Record Locking: Test users were getting the dreaded message “Another user has modified the data…” when running data modification routines in code. Mind you this was after I had optimized the code to use one connection throughout the project. I hope they eventually make a product that is easy to publish to a web based server. (I know, I know, there is the sharepoint publishing…but its clunky, unpredictable and complex). Have you looked at Office 365 & Access 2013 web apps? You may wish to ask for help at UtterAccess.com were there are many users willing to help you. I can assure you it does. Good day Juan, what version of ms access adp youre currently using? Ive been running 2k3 mde with mysql 5, 20 users in win2003 r2 terminal server in both lan and wan, and performance is ok so far its only 500,000 records. I am interested in testing adp for performance comparison. tnx and more power! 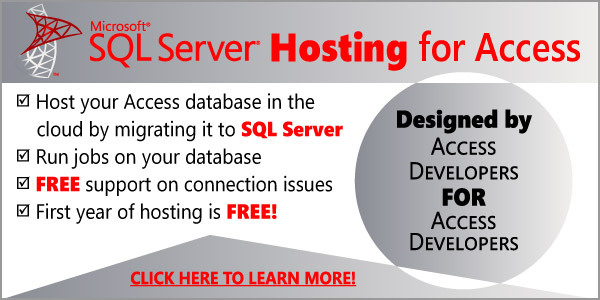 I recommend using Access 2007 ADP, but do keep in mind ADP technology is going away, so I wouldn’t recommend investing any time into it and rather focus on optimizing Access with SQL Server in your code and methodologies.